Back in twenty three years, It was the first day that Cody and Coby showing up in the world of earth. Coby and Cody were two wonderful and handsome twins, they have always planned to stay together as they'd never leave eachother untill death. Coby was one of the most dangerous kids in their house hood, He was leading a small crew which was called *Mess, Less*. Which means, if you'd mess with them, your life would be useless. Cody was one of the crew partners who had started it with Coby, they were actually ruliing to much places in their home country, Amesterdam. Next day after they having their birthday, Three niggers which Coby used to beat their asses up, showed up at his house wth bats, destroying his car,house, etc. with their bodyguards. Coby couldn't of done anything, as he was just deciding about making an ilegal organization which would get bigger and larger. so he decided to escape to Los Santos with a small message sent to his brother; asking him to follow Coby up. Wthin some days of the messge, Cody has finally traveled to Los Santos, trying to find Coby around as he had no cellphone at this time. Cody have been searching for days and days, as he'd finally find him at an place which is full of beer, vodka and such more haram things. When Cody went to Coby to tap his shoulders up; Coby turns around to Cody, dropping tears of his eyes..
Coby has had a knife stratched in his face by some ilegal niggers called MS13. Coby then have been waiting two years of working, trying to get some weapons, drugs for the illegal organization he's starting to show himself in town..
Coby has finally met Diesel in town, communicates with him, as he'd of heard that Diesel is a drug dealer, so they became friends and Coby was buying drugs every time he wanted to do so, once then Coby when to an legal Ammunation to buy some shotguns of him with the reason of, sailing along and uses it for sharks, as the Weapon Dealer accepted, passing around twenty fake toy weapons to Coby, as then Coby arrives to his house; calls his brother and asking him to get to his house for important reasons. Coby was still trying to trying the weapons, shooting at his house's wall,as there'd be a paper flying off the shotgun; with a HAHAHAHA sentence wroten on it. Coby then decides to raid this Ammunation and till yet,he's still deciding when he'll raid them so. Coby has went to Mara Salvatchura thirteen headquarters, burning it up on a late time of America's and spraying it wiith Jefferson Paybacc' Crips are spreading!, as there was some firefighters in there taking the fire out within 30 minutes of the fire. as then he'd leave, throwing a lighter next to the fire as it didn't do anything to them, luckily. Coby and Cody went to Grove Street Familia with some of their boys, looking for alliance with them, as Coby was questioned about few things needed in Grove, loyality trusted as Jefferson Paybacc' Crips were accepted in the alliance with them., Coby were thinking about allying Mafia as well, as they gathered some mens as they of heard that Mafia are one of the street rulers along with Grove now adays, so they of been thinking too much tmes before going to them, they gathered around thirteen mens for their SAFETY and went to speak a long with their Don, Henry Vitale, one of the BEST Don's of La Grigia Mafia, they were told to communicate with them back so soon as Don Henry Vitale would communicate with the other Dons and the Capo Regimes about the alliance before giving Jefferson Paybacc' Crips a call back, as Double O.G Coby McWilliams and O.G Cody McWilliams agreed about his answers, leaving along to their hood with full heads on the air after hearing that Mara Salvatrucha Boss snitched them and went to work with the ARES, The Army Squad. Coby McWilliams the Double O.G and Cody McWilliams with the Double O.G Benny Savage Wallace and one of their Crip boyz, Arbico Johnson have been chilling at the pier, deciding on how to raid the Ammunation that robbed them as they're two people who are fully weaponized with too much guns of the Ammunation and they're also skilled due to training few times at their shooting range, fo the Ammunation's, they also decided on trying to claim the Ammunation for their own. 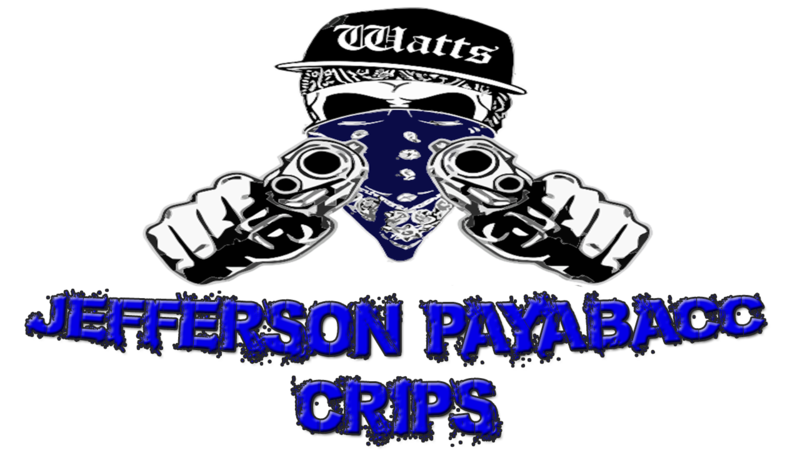 In the incoming days, Jefferson Paybacc' Crips are deciding to start claiming half of Los Santos; leaving the else ofcourse for Mafia and Grove, as they've dealt in the alliance that they'd take a small ammount of turfs and others can be dealt with, and they'd to show up in town and take care of every decision they take, and every thing they should do, they're also thinking of, how to become one of Los Santos thugs, claim half of it, never have snitchs and be one of the greatest ilegal organizations in Los Santos and/or be finishing the cops. Cody and Coby, the two twins with the friends help of, Benny Savage Wallace and Diesel X West will be trying to show up more in Los Santos and other fellow countries and try to be one of the wonderful illegal organizations a.k.a illegal crips in every place, as they'd known so soon and much people will be like, They wanna rep wid' Crips for the rest of their life, as Jefferson Paybacc Crips will be takin' off the sniitchs who would snitch them in the incomig days, they'll also be trying to do their best, to be wth Mafia in same spot.